In a twist of irony, a former bank building that went into foreclosure is headed for the auction block. Laila Freire of Sullivan & Sullivan Auctioneers, LLC confirmed that the former Eastern Bank building, located at 270 Union St., will go up for public auction Friday, Aug. 15 at 11 a.m. The multi-unit building adjacent to downtown is now only partially occupied by The Psychiatric Associates of Lynn. In January 2006, Eastern Bank received authorization from the state Commissioner of Banks to close the branch office located at the corner of Union and Silsbee. According to bank officials at the time, the idea was simply to consolidate bank operations with the Market Street branch. 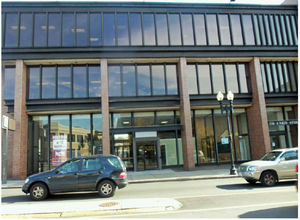 In 2009 the United Way, along with SPIN, Serving People in Need, launched a Financial Stability Center in the building. The building was empty in March 2013 when North Shore Community College announced its plan to move its culinary and cosmetology programs into the building. By December 2013, however, the NSCC plan was scrapped due to financing problems. Mayor Judith Flanagan Kennedy said at the time she was confident another suitable business would be found to occupy the space, but that didn’t happen. According to Economic Development and Industrial Corporation Executive Director James Cowdell, Brian Strasnik owned the building, but Sullivan & Sullivan, a Sandwich-based auction house, will conduct the auction on behalf of Santander Bank. Although it has stood mostly empty for some time, Cowdell said the building, which also has a huge parking lot, remains in great shape. “We would like to see it used as an office building, which will bring jobs as well as people with disposable income for that area,” he added. The bid specifications list the property, which sits adjacent to the downtown area, as a 20,840-plus-square-foot building with a better than 5,000-square-foot finished basement and two elevators with plenty of parking. According to the bid specifications, anyone wanting to put in an offer needs to show up with a $75,000 deposit to participate, and the high bidder will be required to put down a deposit of 10 percent of the final bid within five days of the sale. The balance will be due within 30 days. The auction will be held on the premises at 270 Union St., and prospective bidders can visitwww.sullivan-auctioneers.com for more information as well as the terms of sale. Freire said the event will be held like a typical auction. “There will be straight bidding and will go and go until we get a highest bid, and hopefully it will be high enough that the bank will take it,” she said.